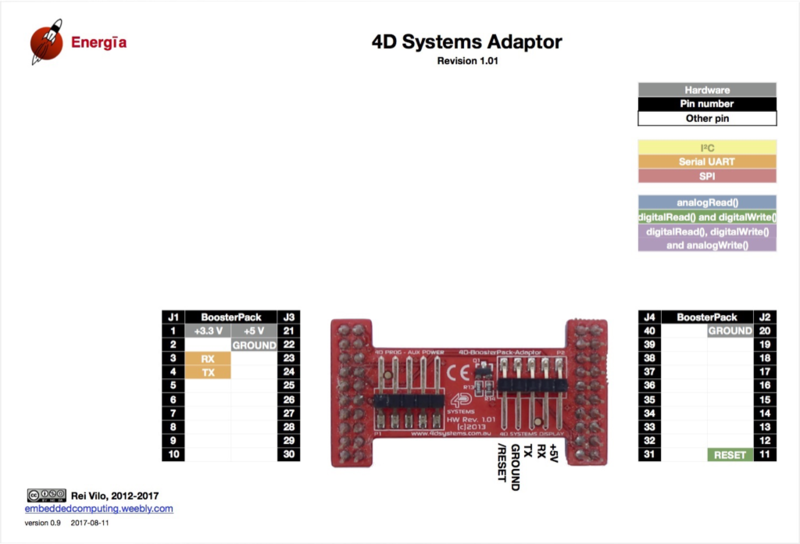 The 4D Systems BoosterPack Adaptor suffers from the same reversed /RESET signal as the Arduino Adaptor. RESET signal is hard-connected to pin 11. Setting pin 11 to HIGH sends /RESET LOW to the screen and thus resets it. Returning pin 11 to LOW is needed to use the screen. The RX / TX lines of the BoosterPack Adaptor are hard-connected to pins 3 / 4, and thus limits the compatibility with the LaunchPads. This is the case for the TM4C LaunchPad, which uses pins 3 / 4 for standard Serial. On the opposite, the MSP432 LaunchPad is compatible. Default Serial is routed to USB, and Serial1 goes to pins 3 / 4 and is available to drive the screen.